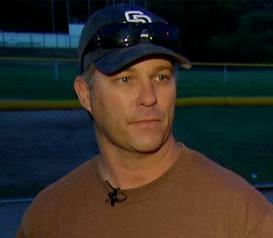 A story is emerging that on Feb. 20th, a little league coach at Robb Field prevented a very bizarre kidnapping attempt of a 7-year boy by a man who was later arrested by police. Coach Scott Hedenkamp is reported to have placed his body in between the boy and a man later identified as Jarrod West to prevent West from grabbing the boy. The incident occurred during little league practice at the OB park. Hedenkamp told NBC7 that he noticed a guy watching one of his players and was pacing back and forth while the team practiced. The stranger was watching the boy from behind home plate, and according to the coach, actually joined the team on the ballfield. Police were called and they arrested the 28-year old West at Robb Field for attempted kidnapping and resisting a police officer.. He was arraigned on Feb. 25th and has a hearing on March 6th. Probably freaked out, the boy at the center of West’s attention was not physically harmed.